Few people outside of the little region of La Axarquia itself know the mountainous, coastal territory in Malaga’s easternmost corner by name. At the far end of the Costa del Sol, La Axarquia is in many ways the antithesis of what the “costa” has come to be associated with, having preserved its natural beauty and historic culture, having avoided an overcrowding of tourist traffic, and maintaining an agricultural way of life dating back millennia. La Axarquia holds more than a few secrets, from hidden beach alcoves and little tread mountain paths, to ancient “pueblos” and surprising culinary traditions. All are ripe for exploration with just a bit of guidance. The Islamic, Arabic influence in Andalusia is well known and well documented since the Moorish rule of Al-Andalus from roughly the 8th through the 15th century. Yet the Phoenicians settled the land some 3000 years ago and the Romans left their mark on the region during their expansive empire. Such was the importance of the Jewish and Christian legacies, for centuries coexisting harmoniously with the Islamic Moors, that Andalusia is oft referred to as the land of the Three Cultures and a few of the villages have festivals to commemorate this cultural heritage. These influences are all evident today, especially in La Axarquia though it is often overlooked in favor of the popular routes through the Andalusian capitals of Malaga, Granada, Sevilla and Cordoba. Phoenician ruins and relics stand with little notice, such as the Castle of Zalia near Alcaucin, and remains of colonies near the mouth of the Velez River. Though the conquering Christians saw to the destruction of numerous mosques and Moorish castles, there are still many well preserved fortresses and towers evidencing the network that stretched visibly across the regions connecting the aforementioned capital cities. Through La Axarquia there are notable examples along the coastline and heading inland through the Velez valley directly toward Granada. La Axarquia is unique in that it was the final stronghold of the Islamic Moors before their final defeat and ultimate expulsion more than 100 years after the Reconquest in 1492. Apart from the stand-alone archeological sites, the majority of the physical remnants of the rich historical heritage of La Axarquia are found in the capital city and the historic white washed pueblos in the surrounding areas. The most important Moorish fortress in La Axarquia was built in the 10th century atop a hill in the capital of the region, Velez-Malaga. It remained a strategic site until the end of the 19th century, and today the site has been restored and opened to visitors as a monument to preserve and commemorate its importance in the development and history of the city. The surrounding “medina” is mostly privately owned and nobody quite knows what historical treasures may be unearthed within. In recent years, for example, a “mihrab” (an arch facing Mecca to designate which direction Muslim devotees should face when praying) from the 14th century was discovered and is now open to the public at the Plaza de Gloria. Still, any wander through the old medina will capture the imagination and take visitors back in time. Velez-Malaga is rich with many more intriguing historical sites, including the old fortified city walls, and numerous churches and cathedrals of note from across the ages. For an insightful and deeper look into the history and historical sites of Velez-Malaga, see the newly influential and authoritative website Mi Velez Malaga. The quaint little white-washed villages of La Axarquia each form a unique identity, and although many are within close proximity, each holds its own revealing history. 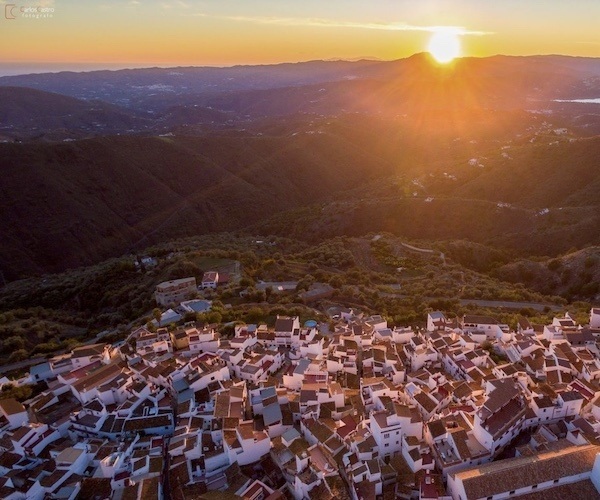 Frigiliana, for example, is often listed as one of the most beautiful villages in all of Spain, with it’s hand-laid cobble stone streets of smooth river stone and floral window boxes adorning the pedestrian walkways, its privileged sea views and carefully maintained gardens. It’s also the site of the final, bloody stand of the Moors against the Christians in Andalusia well after the Expulsion of 1492. Below Frigiliana sits the popular coastal town of Nerja with a maze of pedestrianised shopping streets and a clutch of fine restaurants. Meanwhile, Comares, perched nearly 750m above the sea beyond and surrounded by mountains, presents a labyrinthine interior. The confusion of streets were specifically designed to deter raiders from the coast and worked well as a bulwark from around the 3rd century BC until the final handover from the Moors to the Christians in 1487. From Comares one sees a white speck of the village of Alcaucin below the imposing peak of La Maroma, the highest mountain in the region at over 2000m, and its neighboring village of Canillas de Aceituno. From here through the mountains and numerous villages lies the historic Mudejar route, from the period when the Moors that remained under Christian rule continued to contribute to the art and architecture of the area. One of the most notable examples of Mudejar architecture from this area is in the sleepy village of Archez, with its iconic church tower, originally built as a minaret in the 14th century. La Axarquia is and has virtually always been an agricultural region. The Phoenicians brought olives with them and began cultivation 3000 years ago. Similarly, grapes and wine production began at the same time, with the predominant variety today being the sweet Moscatel grape, for which the area is still famous. This is the same variety brought by the Phoenicians and remains today the oldest unadulterated grape variety in the world (Muscat de Alexandria). Some of the more important wineries in the region, available for tours, include Bodegas Bentomiz and Bodegas Dimobe. Today the region is one of the preeminent producers of tropical fruit in all of Europe, and the largest in Spain, also contributing to the famed olive oil production of the wider Andalusia region where more than half of the world’s 50 best olive oils are produced. It’s no surprise that many of the characterful villages of La Axarquia celebrate the harvest with various fiestas for such products as cherries, chestnuts, almonds and tropical fruits such as nispero and cherimoya as well as grapes. It’s also no surprise that in La Axarquia you will find some of the finest restaurants within the long stretch of coast from Malaga to Almeria. Nerja has a fine grouping, including Restaurante Sollun and Restaurante Oliva. Chin Chin Puerto in Caleta de Velez, serves some of the freshest and finest seafood anywhere, delivering the days catch from just steps away at the busy fishing port. For more rugged and traditional fare, restaurants such as La Sociedad in Canillas de Aceituno are famous for their roast kid (chivo lechal). Finally, the newly opened Mercado de San Francisco in the heart of Velez-Malaga offers a refined taste of tapas from the open hall, or elaborate menus from Mangoa restaurant alongside. Ultimately, one of the main attractions of La Axarquia is the tranquility of the pastoral hillsides and expanses of Mediterranean Sea visible from therein. It’s a step back in time where you may pass farmers hauling their harvest by donkey, and the interior terrain has not been spoiled by over building and crowding. The convergence of three mountain ranges dominates the landscape, with the peak of La Maroma anchoring the surrounding foothills. The hiking trails from Alcaucin and Canillas de Aceituno expose some of the most stunning scenery in all of Andalusia, and you’ll rarely pass other hikers once you begin an ascent, only mountain goats and eagles. Beyond Nerja to the east, from Maro to the parks of Cerro Gordo at the Granada border, the cliffs fall dramatically into the sea exposing hidden alcoves, caves, and beaches inaccessible but by sea. Driving along this stretch of coast one finds laybys for taking in the views or climbing down to secret beaches; however, you can also hire kayaks from around Maro or La Herradura to the opposite end. The aforementioned restaurant, Chin Chin Puerto also hires out a catamaran for dolphin viewing and coastal tours for a look back at these hidden beaches. The coastal areas of La Axarquia boast the best climate in Europe, affording outdoor activities in all seasons with more than 300 days of sunshine every year. There’s truly something for everyone at any time of year and if you don’t make it this season, you can rest assured that the region will not have changed much before you are able to make it. Alan Hazel is Owner and Director of Cortijo El Carligto. Cortijo el Carligto is a private Andalucían hideaway and luxury rental estate in the hills of Malaga, Spain, overlooking the Mediterranean. I’ve only ever got as far as Nerja which is an atmospheric and beautiful place. After reading this I’ve learnt that I should keep driving East to escape from the mass tourism. Axarquia seems more like the Old Spain. It sounds like a land that has clung onto the past without being hit by the excesses of modern tourism. Along much of the Costa del Sol there isn’t much surviving evidence of the Islamic and Jewish influences. Some people would say there ain’t much of Spain left either. A few years ago I learnt of the Mudéjar Route and this evocative piece has brought the region to mind once more. The Mudéjar Route is a trail of some 50 miles or so through the region, calling in on five villages. The people were Christian but they were still influenced by Moorish architecture. In the blistering heat of summer, following the cooling principles of Moor design, from a race used to living in comfort in even hotter southern summers, was no bad thing. Anyway, I fancied a leisurely drive through this beautiful land stopping for salads doused with some of the world’s finest Olive Oils – though I would have looked further afield for my glass of wine, I’m not a fan of sweet wines. This is unspoilt Spain, probably as it was 50 years ago. I thought this sort of place was long gone. I’d love to visit. I just didn’t know about this region. Looks like a lovely place to visit for a day. Not somewhere I would think of when visiting Andalusia since the first cities I would visit would be Granada, Seville, Cordoba, and Malaga. If this is close enough to one of these cities, it would be worth a side trip. Who knows, I might discover it’s idyllic charms to be a surprise.